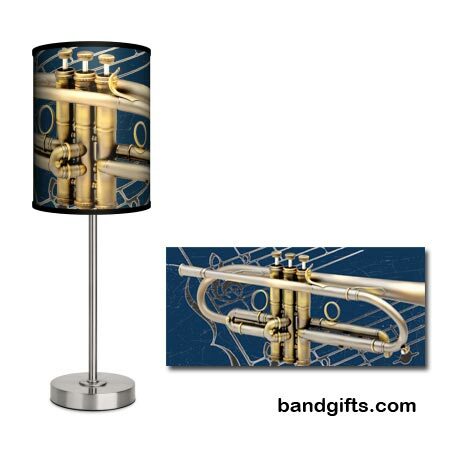 Trumpet Lamp – Spruce up any trumpet lover’s room or office with this Trumpet Lamp! Features the design of a single trumpet going around the shade. This is definitely a stand-out and unique light source. Makes a great gift for a music teacher’s classroom as well. Accepts a 13-watt CFL or up to 75-watt incandescent light bulb (not included). Comes with a sturdy brushed nickel lamp base and shade. The lamp measures at approx. 21″ H X 7″ W.
This item will be drop-shipped from another location. Please allow 2 weeks for delivery. Shipping to Contiguous USA only. Great Trumpet Gifts at DRUM BUM! © 2018 Drum Bum, Inc. All Rights Reserved.